In the heart of the city I discovered some remarkable placemaking experiences. In the long center stretch of a wide boulevard I came upon a pop-up botanical sculpture garden and evening light show for the community and tourists to enjoy. 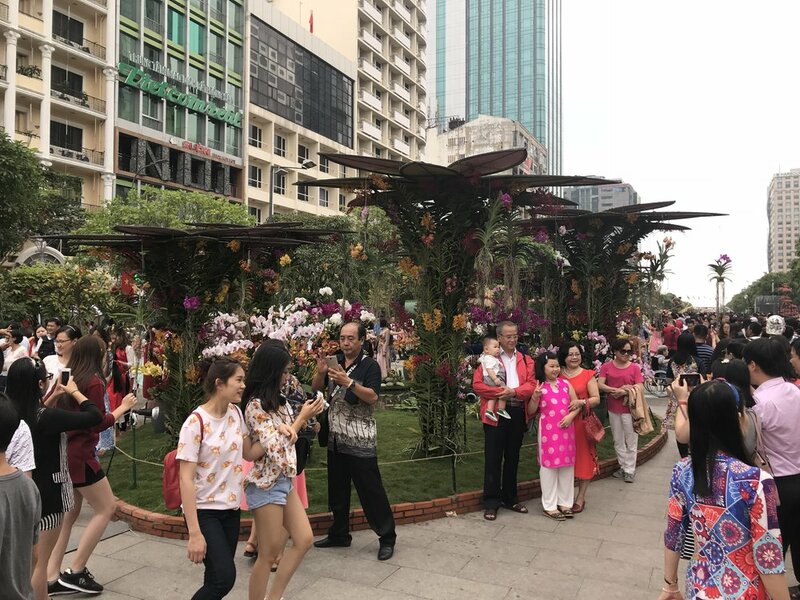 Ho Chi Minh City authorities opened its Lunar New Year 2018 Flower Street on Nguyen Hue Pedestrian Street on the evening of February 13th. To say that it was outstanding wouldn't do it justice – I was very inspired by our visit and are still processing all the creativity in action. Heurista is interested in understanding measurable vibrancy as a result of placemaking. Globally, an enormous amount of families celebrate a Lunar New Year and centralize their attention on blessings, good fortune and giving. Vibrancy is a distinct trait and is manifested differently from place to place. I have captured several key indicators that we see in all vibrant places. Vibrant places inspire families to connect. The basic design of the activation in Ho Chi Men City created a runway of opportunities for families to gather and pose for a memory. The vibrancy was contagious. Each creation was designed to tell a specific story about the New Year based on Dogs and the creativity of Vietnam in the upcoming Year of the Dog. Every generation was at play together. Youngsters were delighted by the vibrant colors and playful poses. Parents and grandparents guided the enthusiasm – mostly hand in hand – and pointed out their favorite sights. Vibrant places create multigenerational engagement through design, storytelling and memory making. Creating vibrancy depends on designing a place that works. The design of the Tet flower street considered the logistics of large crowds – maintaining the displays and balancing scale with thoughtful details. Families could easily find areas to pose for a picture without feeling crowded. Each display had obvious boundaries and was landscaped to give visitors clear views of the crafts while keeping the displays out of reach. Vibrancy will always flourish when there is a sense that something special is happening. Pop Up retailing knows this. The design for Tet leveraged creativity and a pop up mindset to create vibrancy. After dark lights added even more magic to the details. Vibrancy happens between real people in real life. Placemaking that creates vibrancy offers more than what comes from our screens. Traditional retail is learning this the hard way. Many cities and towns are busy implementing best practices for placemaking to compete with the attention given to the virtual world. At Tet the planners combined pop up children’s bookstores to give families an opportunity to sit and put their screens away. It was a great combination. Beyond the actual experience of the displays, the visual feast was designed to ‘go viral’. There were no hash tags. There were no incentives to share. Real vibrancy creates digital buzz. Heurista will continue to identify indicators of vibrancy as a result of thoughtful placemaking. The Year of the Dog is already showing us great examples.